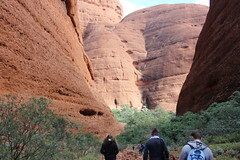 Well we were on our way to Uluru, previously known as Ayres Rock. What would we see? What would we feel? How would we react when we saw the rock? Is this the ultimate destination in Australia? Lots of questions, I know, but relevant I would think. The boys were excited, the other half was excited. Me? Not sure. I wonder what people over the world would think of when prompted about Australia? When questioned would they say yes, we know of the Great Barrier Reef, the Sydney Opera House and yes Kangaroo’s. Malcolm Turnbull? Bob Hawke? Paul Hogan? Sorry! I digress. Would they say, Ayres Rock(Uluru)? I somehow think that yes Uluru would be near or at the top of the list. I think for most of us Australians its a pilgrimage of sorts. Not sure if that’s true or not but most people have either been or want to go and I’m sure there’s some that just couldn’t be bothered. I must admit that as we drew closer to seeing the “Rock” the excitement level was rising. You don’t see much from the road as you approach Yulara(town/resort next to Uluru), but it’s still a “WOW” moment when you catch that first glimpse. Here’s this great monolith of a rock that just protrudes from the surrounding landscape in what is practically the centre of Australia. Yes I know it’s not the geographical centre of Australia, that’s only about 300km away as the crow flies. We did notice four-wheel drive vehicles up on top of the sand dunes getting clear views of the Rock, but we were pressing on to the Yulara and the Ayres Rock Resort-Ayres rock Campground. That’s an oxymoron if ever there was one! Resort, ha! Not this campground. Else where maybe if you were paying big bucks at one of the fine and dandy accommodation resorts. You see, we hadn’t booked a campsite. Mind you we had rung about 4 days out but it was fully booked out, great I thought! “Don’t worry” they said, ‘just turn up and you can find a spot in the overflow section and its only $10 dollars a night”. Click, click, mental arithmetic happening, 3 nights, 10 dollars a night, got it, $30 bucks, gee that’s cheap, end of mental arithmetic. They also said get there early in the day to get the best spots(aka-closest spots to the amenities block in the actual campground). We have noticed in the Northern Territory that at the big campgrounds there are queuing up lanes to get in and they are usually full towards the end of the day or even after lunch! So we got there in the early afternoon and a bonus we didn’t have to wait too long and we were in looking for the overflow section. I guarantee you that the overflow section was in the vicinity of 10-20 times bigger than the actual campground and the front section(aka-closest to the amenities block) was virtually full. If you ever want to see what caravans and camper trailers are in use around Australia this would be the place to go! We found a spot amongst some small scrubby plants including Grevillea and set up camp, got the binoculars out to look for the amenities block and discovered them about 600 metres away! Time to set up a shuttle bus to get to the toilet!! Not a great picture but this is the Shanty Town-Overflow section or most of it!. Below is the section closest to the amenities on the right which you cant see and we are located in the left of this picture. The Khaki setup on the left at the front. The funny thing is that this overflow virtually empties and fills every day, which is not surprising when you see the amount of travellers on the road! There was also some campers here in this section that obviously were spending a week or two here and they had worked their way to the front of the overflow section therefore being only 40-50 metres away from the amenities. They were also from the Territory and obviously knew about the cheap overflow section. The sun was now starting to sink and the park had a sunset viewing area of the rock. So off we trundled with the crowds to have a look. The area was slightly busy, so we worked our way along the dunes until we had our own mostly private viewing area. This is what we saw! At last, Uluru in all its glory. And now no sun. Beautiful! How is it that Uluru changes colour so much? Well, the answer is quite simple. The colour changes as a result from the effects of the earths atmosphere on the suns incoming rays. Dust, ash and water vapour in the atmosphere act as a filter which can remove the bluer light from the suns rays, allowing redder light through at different times of the day. When the sun is directly overhead, the suns rays only have to pass through a thin atmosphere therefore minimising the filtering effect. Whereas in the mornings or evenings when the sun is low on either horizon, the suns rays have to travel through a thicker layer of atmosphere to reach a certain point on the earths surface. The light reaching Uluru at sunset or sunrise is mainly from the red end of the spectrum and its reflection from the rock and clouds in the sky cause the spectacular colours. The surrounding landscape further enhances these effects. A peculiar plant caught my eye on these dunes know as Green Bird flower, Crotalaria cunninghamii. 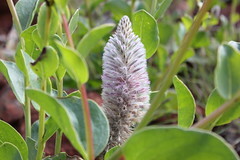 This shrub growing between 1 and 3 metres is found in inland areas on red sand dunes. Can be erect or sprawling with velvety stems. Large yellow-green flowers striped with fine black or purple pin strips are present on terminal racemes to 22cm in length during winter and spring. Time to head back to camp and cook tea. Check out the amazing colour of the dirt(sand really!). Today was a holiday in the Northern Territory, Territory Day! This is the only day of the year you can buy fireworks and let them off in the Northern Territory!! We had been warned and sure enough well into the night and even early next morning fireworks were going off everywhere at Yulara. What a racket! Could only imagine what it would be like in Alice Springs or even Darwin! The next morning greeted us with drizzly rain and puddles. What a day to visit Uluru, yuck, it wasn’t looking good. We made our way to Uluru-Kata Tjuta National Park getting glimpses of a wet rock on the way. It still looked amazing and impressive in the landscape. Here are some Honey Grevillea’s, Grevillea eriostachya, these were everywhere around Uluru, flashes of brilliant yellow amongst a red and green background. Grows to about 3 metres and flowers for a long time in winter and spring. We made our way to the Cultural centre to escape the rain and learn more of Uluru and the Anangu Land which is run by the traditional landowners who are the Yankunyjatjara and Pitjantjatjara people. From the guide-book, “This land was created by the creation ancestors. In their travels they left marks in the land and made laws for us to keep and live by. We hope that during your visit you will learn about some of our ancestors and culture. Please respect this knowledge and open your minds and hearts so you can really appreciate our enduring culture” There were lots of things to see and do in the Cultural Centre. I overheard a tourist asking a Park employee what was worth looking at Uluru during the rain. The response was “do the Mala walk, it has brilliant waterfalls during wet weather”. So off we trundled into the rain to do the Mala Walk. Its only 2km return and flat, so very easy. Our plan had been to cycle around Uluru but the hire company doesn’t operate in the wet. As we had two bikes with us, we needed another 4. That wasn’t going to work, was it! Back to the Mala walk, Mala is Aboriginal for Rufous hare-wallaby. Click HERE to see what it looks like. Could be an overgrown rat crossed with a Hare!! In this section there were sheer vertical cliffs which were impressive. It was simply stunning to see Uluru in the rain. It had stopped mostly but the waterfalls were still running albeit slower and smaller. 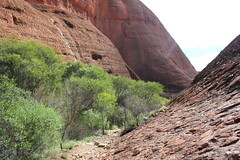 I have since seen photos after and during major deluges on Uluru which show water cascading down everywhere in huge quantities. Everywhere you turned to look at Uluru you would see different colours in the rock and this changes as the sun rises and sets on it as well. 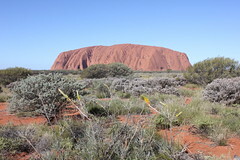 Notice above how the rain has changed the colour of the rock What is Uluru composed of? “Uluru is composed of arkose, a coarse-grained sandstone rich in the mineral feldspar. The sandy sediment, which hardened to form this arkose, was eroded from high mountains composed largely of granite” , this is quoted from the online Department of the Environment and Energy. 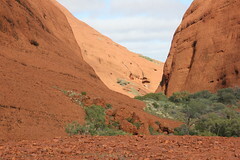 Click HERE if you want to know more of the Geology of Uluru. An interesting piece of information is that Uluru is a visible tip of a huge rock slab that extends possibly 6 kilometres underground! The exposed bit is supposed to be the biggest exposed rock going around, imagine if it was all exposed!! Beautiful scenery where ever you turned. Below is Kantju Gorge a wonderful location with a lovely waterfall. Not much to say really, simply enchanting. We then drove around to the sunset/sunrise viewing area which is on the opposite side to the Mala walk and here you get a completely different aspect of Uluru. Another view from the sunset/sunrise viewing area. The Wattle above is Acacia ligulata, also known as Umbrella Bush, this grows to about 4 metres. When you look closely at the surface of Uluru, it looks like its flaking and it is. This is caused by a chemical decay of minerals. The rusty colour of the exposed surface of these flakes is caused by the oxidation (rusting) of the iron in the Arkose. Fresh Arkose is grey in colour. Some more examples below. Below is Ptilotus obovatus, a lovely little shrub to about 1 metre high and across has pink flowers frequently after rain. Often seen on shallow stony ground. The leaves are covered with star-shaped hairs giving the plant a silvery appearance. I saw this one on the Kuniya Walk, which is an easy walk to the Mutijulu Waterhole home of Wanampi, an ancestral water snake. Closeup of Ptilotus flowers Here is the Mutitjula Waterhole, another special place at Uluru. The photo below in some way summed up Uluru for us. The comment was made something along the lines of “look its breathing” or something of that effect. Well! It did sort of feel alive, maybe it was just the flow of Arkose Sandstone and how it was shaped or how the rain ran off it, maybe its cultural significance, even its history over time or maybe all of the previous combined. It just felt significant. I can now understand why the traditional owners revere it. This is a special place. 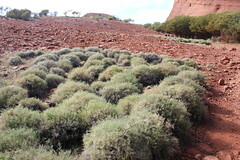 Here’s a few more plants I noticed on our travels around Uluru. This is Upside down plant, Leptosema chambersii. Obviously you can see how it got its common name. It’s a bit topsy turvy with the flowers at the bottom. A small shrub with leaves reduced to scales. Lives on sand plains and dunes normally with Triodia sp. Closeup below. Another interesting plant was Bush Plum, Santalum lanceolatum, it grows to about 7 metres as a shrub or small tree on a wide variety of habitats and flowers throughout the year. Fruit is usually eaten straight from the tree, older branches are also harvested for sandlewood. The large trees around Uluru were Desert Bloodwood, also known as Corymbia terminalis . There were also a large Grevillea called Beefwood. Grevillea striata. Well the day was coming to an end and we hadn’t done everything we wanted to due to the weather and consideration for children. We were damp, tired and pretty chuffed that we had finally made it to this legend of our great southern land, Uluru, a monolithic breathing living monstrous rock. Finally, a last parting glance for this day at this magical place known as Uluru. Having spent 2 nights at Kings Canyon, it was time to move on towards the ultimate destination in the Northern Territory, maybe even the whole of Australia?? If you’re not sure what that might be stay tuned for part 11 while we have a quick look at Kathleen Springs. We stopped here while travelling onto that great destination. Kathleen Springs is an easy 2.5km return walk through lots of interesting flora to a permanent spring. Along the way there are remnants of old cattle yards which show its previous history and descriptive marker boards relating to Aboriginal activities here. Below is quite a bizarre looking plant called the Orange Spade Flower, Hybanthus aurantiacus . This is a small erect shrub to about 40cm and quite widespread although I only saw it in a couple of places. The flowers have five petals, four very small ones and one large one shaped like a shovel!! Here is a closeup of the shovel! Here’s some more sea ripples, although the indigenous people have a slightly different story about these ripples. If you remember in Part 9, we saw some of these ripples on the Rim Walk at Kings Canyon. See below for a different take on these! I don’t particularly want to meet Inturrkunya!! Golden Orb Spider with its young, we get these at home as well although this one was massive! Below we have Hibiscus leptocladys also known as the Variable Leaf Hibiscus. It grows to about 1.5m or occasionally to 2m and is quite widespread in the Northern Territory. This is Abutilon leucopetalum, also known as Lantern Bush, grows to about 1m or less. This one I think is Swainsona flavicarinata, Known as Swainsona or Yellow Keeled Swainsona. This is a prostrate herb. This one is quite possibly Indigofera basedowii, a perennial shrub to 1 metre with grey-pubescent foliage with inflorescences to 11cm long. This one is Senecio gregorii , alson known as Annual Yellowtop, grows to 40cm high and is an annual. Widespread throughout all states. This is Scaevola parvibarbata a perennial growing to about 50cm, widespread on sandy areas. So there you have it, a short interlude at Kathleen Springs on our way to another great destination in the Northern Territory! A trip to the Northern Territory. Part 9. Now I never thought that I would do a nine part and counting series on our three-week holiday to the Northern Territory, but here we are! No need to panic just yet, I can assure you that it wont be long and we’ll be on the home stretch. Meanwhile the stretch of road we were facing now was the Meerenie Loop. A 154km stretch of dirt road which is a short cut to get to Kings Canyon, you can go the long way its only about 500km! For the Meerenie loop you need a permit as it goes through some Aboriginal Land Trust area, also a 4 wheel drive vehicle of some description would be beneficial although not mandatory. I’ve taken the next bit from The Outback Travellers Track Guide Book for Alice Springs to Yulara. “The Meerenie Loop is very undulating with many crests, dips and creek floodways. This area is mainly gravel with some rocky sections but is often plagued with corrugations and dusty conditions”. To say it was corrugated and dusty would be a slight understatement to say the least! The first section was an absolute quagmire of corrugations and at a slow speed you felt like you were on some sort of manic rollercoaster, every bump was a shudder of immense proportions. This was going to be great for another 140 kilometres. It did improve though. We decided to see what would happen at a faster speed! Well it was an improvement at a speed of 75-85kmh, mind you it was now a constant smaller shuddering. I can only describe it as a cat the size of an elephant purring beneath your car with the reverberations oozing up into the vehicle and oneself. Everything was just a constant shudder! You can see above the dips and creek floodways, these were the worst. As you approached you would slow down to get across them and occasionally some were quite deep with pot holes in them which the front tyres would slam into with a tremendous thump. It all sounds bad but it was an enjoyable experience and the scenery was quite beautiful. Look at the rolling seam of rock in the left side of the photo above. There was a couple of classic road signs we saw, both on 44 gallon drums, one before a corner “LIFT UM FOOT” and the other around the corner “PUTTUN BACK DOWN”. I was too slow in getting any shots but click HERE to check them out! What a classic!. Having stopped for lunch and then continued on our way we soon came to Ginty’s Lookout. In the distance you can see George Gills Range and Kings Canyon is at the right hand end of this range in these photos. I think the boys enjoyed a chance to stretch and let off some steam, also gave me a chance to quickly check the vehicle and camper trailer were all in one piece. There was a slight problem with the bike rack attachment on the camper trailer, parts of it had come loose and needed replacement, luckily I had spares! Of course there were plants to admire, check out this pretty Erimophila! Cant remember how long it took to complete our journey along the Meerenie loop but we had finally arrive at Kings Canyon. Just in time to set up camp and then watch the suns rays set on the entrance to the canyon. The next morning dawned fresh and bright and away we went to get amongst the Canyon. 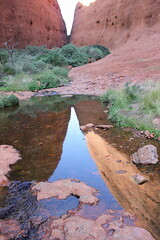 Kings Canyon is part of the Watarrka National Park and sits at the west end of the George Gills Range. The walls in the canyon are over 100 metres high and make for some great panoramic views. Here we go on the rim walk which is highly recommended, give yourself at least 4 hours to truly appreciate this place and watch out for the opening climb, it will test you! Make sure you stop on the way up this straight up climb to admire the views, just don’t let on that you’re puffed! Here’s one of my scenic views(puff,puff,puff) lucky there was some plants to look at! Above is Tall Mulla Mula also known as Pussytails or scientifically as Ptilotus exaltatus. Below is a Blue Bush. Maireana sp, I’m not sure which one, there are 57 specie endemic to Australia. Now that I’ve got my breath back, lets continue up the steep climb! In the above photo in the middle on the right you can see the car park receding in the distance. Below you can see the canyon walls starting to come into view. The river of green at the bottom is Kings Creek, providing the life blood for those plants. Once you get to the top the rest of the Rim walk is quite easy and breathtaking at the same time! Firstly you are walking through scrubland and rocky formations before you really get anywhere near the rim. Mind you, you don’t want to get too close to the edge! Picture below is of Sandstone mounds which are quite prolific up on the top of the George Gills Range. They are known as Mereenie Sandstone which has been cross bedded. Basically over time(lots of time) wind has deposited sand in different directions(see description in next photo). The domes you see have been eroded along joint-bounded blocks with rain and wind eroding the corners and sides of the blocks giving us these domed shaped sandstone mounds. Looking closely below you will see Rhinoceros Rock. Well that’s what I called it! 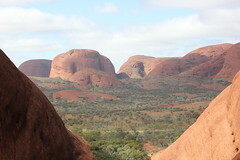 These two photos you can see those Sandstone domes I mentioned earlier. Now we come to parts where you need to hold your breath as you edge closer to the edge. It is a shear drop off the edge there! Kings Canyon sits in what is known as the Amadeus Basin which is a intracratonic depression covering approximately 170,000 square Kilometres in Central Australia. Interpret that as an inland sea I would think! Now I will quote the Geology of Kings Canyon National Park by L. Bages, report 4 for the Northern Territory Geological Survey. “The oldest exposed rocks in the park are those of the shallow-marine to continental Cambrian Pertaoorrta Group. This group is conformably overlain by the marine Cambro-Ordovician Larapinta Group which is conformably overlain by the shallow-marine Mereenie Sandstone. The sequence was gently folded, faulted and partly joined during the Alice Springs Orogeny between 400-300 million years ago. Since the Carboniferous, the area has undergone a long period of erosion. During the Tertiary, the climate was tropical; fluvial sediments were deposited in places and silcrete and ferricrete were formed. During a period which lasted from the late Tertiary to the Quaternary, acolian sand dunes and sheets, which now cover large areas in Central Australia, were deposited under arid conditions.” Did you get all that?? Basically means what a fantastic landscape we are looking at now!! Here we have the ocean floor with ripples in it, incredible! Above we are looking out towards the car park and yes, the views are quite beautiful. Yes you are correct, those are people on the opposite side of the canyon looking over the edge! No fences here! Scary! Not a great photo below but just showing a chasm(Joint) and the cross bedding(layers) in the sandstone. Lets have a look at a few of the plants up here. The Desert Heath Myrtle, Thryptomene maisonneuve were in full flower. 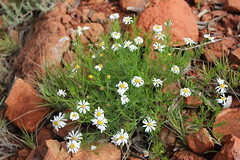 These Thryptomenes are widespread throughout arid Australia and can grow to 1.5m high. The ones on top of Kings Canyon in the open were quite close to the ground to get out of the wind! Below is Macrozamia macdonnellii, The Macdonnell Ranges Cycad, interesting to see cycads out in arid country! This one below looks like some kind of Hibbertia sp. Also know as Guinea Flowers, pretty nether the less. Not sure of this one, obviously situated in the Daisy family, could be a Calotis or a Minuria or some form of Brachycome or I could be totally off the money. Nice flowers though! This is Pandorea doratoxylon which we saw at Serpentine Gorge . This is the stunning Holly Leaf Grevillea, Grevillea wickhamii. A shrub or small tree 1-4m or even 8m tall in places, seen in Western Australia and inland Northern Territory. We’ll leave the plants alone for a little while and head back into the scenic elements of Kings Canyon. Below we are looking into the Garden of Eden, an oasis in the middle of Kings Canyon fed via Kings Creek which creates a sublime environment in the heart of this arid country. Look at the reflection in the water, beautiful! Here is a stand of the Macdonnell Ranges Cycads. Check out these reflections! Not Bad! The one below is actually taken looking directly into the water! Staircase leading out of the Garden of Eden and on towards the rest of the Rim Walk. Here we are around the other side of the rim. That edge to the right of those people is a straight drop of about 100m or more and then maybe double that to Kings creek at the bottom, scary stuff! On this Sandstone cliff you can see the horizontal layers that have been laid down over time. Wow! A bit more information above and no we didn’t smash any rocks to check the insides! The colours were truly amazing! I like this one above, it shows a couple of fault lines running in different directions. We are now on our way back towards ground level and the finish of the Rim Walk, a few more plants have caught my eye! I think this one is either a Goodenia, Lechenaultia or Velleia sp. Pretty little shrub on the sandstone hills on top of the canyon. This one below is quite possibly Goodenia cycloptera. Plants have an amazing knack of growing anywhere, have a look at this fig below. This one below looks like a bit of an oddity and haven’t been able to work it out yet! A few more pics of Ptilotus exaltatus. Here’s a good photo of one we’ve seen before, Solanum quadriloculatum. This is Kestrel Falls, apparently where lots of Kestrel’s roost and also some good waterfalls here during the wet season. A few more plant photos showing the tough environment here. Well I must admit that’s about it. It was a big day and everyone enjoyed it even though we were tired! It was good to sit down again! Ormiston Gorge and the Ochre Pits. Driving further west on Namatjira Drive you soon come across a sign that says Ochre Pits turn here! I remember the conversation was like this, “Do we want to turn off here and have a look?”,”not really”, “you sure?”, “yeah, don’t know”, “Well why don’t we have a quick look and see what it’s about, not likely coming down this road again in the near future”. So we turned off and had a look at the Ochre Pits. Very glad that we did because we enjoyed it. The small cliffs are several multi coloured layers of rock showing a wide range of colours. It was and is still used for ceremonies, trading with other clans, even used to protect weapons, click HEAR to find out how. Layers upon layers of different coloured rock, it was quite stunning and one could imagine the shifts in colour during the day and the seasons. Above is some plant trying to cling on in a very harsh environment. Some views below of the creek bed that runs through here. The colours were even evident in the creek bed, see below. Here we can see where it has been mined. Another colourful photo! Or two or three! There’s no point stopping somewhere without checking out the plant life! Back in the Pajero and another 17 km’s and we have now arrived at Ormiston Gorge. We had hoped to camp here but the small camp ground was chock-a-block and the sun was on the way down, so we knew we had limited time here which was a shame. Another beautiful Gorge here in the West Macdonnell Ranges on a similar vein to Serpentine Gorge but quite possibly even prettier! Perfect spot for a swim during the heat of the day, alas it was winter time! Some intriguing rock colour and formations below. Of course the plant life here took up some of my time, below is the Long Leafed Corkwood, Hakea suberea , quite common in dry desert regions. This is a large shrub or small tree 3-8m in height with dark brown cork like bark. Beautiful flowers produced in winter-spring, 4-15cm in length. See above the contorted and gnarly branches and the beautiful flowers below. Another interesting plant was Wahlenbergia communis , the Tufted Blue Bell growing to 75cm on alluvial plains and intermittent watercourses plus run off area’s, often found in sandy soils as well. A wide-spread perennial in all mainland states. Not a great photo below but a close-up nether the less. Here’s some more rugged cliffs. Did you notice the gum tree’s growing on the sides of these cliffs, not many but a few hanging on for dear life! What about this view below, pretty special I reckon! Whichever direction you looked it looked pretty special! Time to get moving the sun was sinking towards the western horizon and we needed to find a camp site. We continued on past Glen Helen Lodge until we found a track that drifted off the road into the scrub. Little did we know at the time but we had camped in front of Mt Sonder. This is one end of the Larapinta trail which runs for 223km to Alice Springs. The quietness out here was simply breathtaking or maybe blissful or mind-numbing. Might depend on your mood! Time to get set up before the sun disappears! Now for a bit of exploring! That means plant hunting really! Now the plant below I’ve shown before, but here it is again in a pretty cool setting. Solanum quadriloculatum . Plus a couple of close-ups of the flowers, sort of! Here’s a couple of sunset type photos. Amazing how the rock changes colour according to the light.